There was no morning parade or evening concert for Howard alumni and fans who returned for the university’s homecoming weekend. Those who turned to the homecoming game hoping for an extra jolt of excitement before Saturday night’s festivities were left equally disappointed. The Bison (1-6, 1-3) welcomed North Carolina A&T and sensational running back Tarik Cohen to Washington, D.C., and the senior rushed for a score and 133 yards on 20 carries to help run the Aggies (5-2, 4-0) past their MEAC foes, 34-7. Cohen spun, high-stepped, reverse-field and did whatever he wanted as he reached the 5,000 career-yard mark and 1,000 yards for a fourth consecutive season. Tarik Cohen (28) of the North Carolina A&T Aggies sprints forward after taking the hand off from Lamar Raynard (7) during the Howard Homecoming game between Howard and North Carolina A&T on October 22, 2016 in Washington D.C. The Aggies defeated the Bison 34-7. This was no more evident than when he took a screen pass on the first play of the second half, initially ran left, then decided to shift gears toward the right side of the field, and found himself in the end zone 45 yards later. That put A&T up 27-0. When asked about who else on the team stood out for him, Cohen immediately mentioned defensive tackle Julian McKnight, who played through double teams part of the game, and a defense, which only allowed Howard a single score in garbage time and 50 yards rushing on 34 carries. Coming into the game, the Bison were averaging 176 yards. The defensive players weren’t the only ones getting hyped after they’d had a fourth-down stop in the red zone or forced a Howard punt. At one point, offensive players were yelling at a defensive teammate who would’ve had an interception if he’d really gone for the ball. He pointed to his chest, acknowledging had he kept breaking on the ball, he would’ve had the interception. Cohen pointed to the 58-21 loss on Sept. 17 to Tulsa as being the catalyst for the shift in the team’s play. Since that game, the Aggies are 4-0 and winning by about 25 points a game. “We expect to put on another show,” Cohen said of A&T’s homecoming game against Florida A&M on Saturday. Darius Leonard covers a lot of ground for South Carolina State. Leonard, the Bulldogs junior linebacker, had 11 total and eight solo tackles along with 2.5 tackles for a loss in leading S.C. State to a 30-3 victory over Delaware State. This was the Bulldogs’ (3-3 overall, 3-0 MEAC) third consecutive league win. Leonard, a 6-foot-3, 220-pounder, is one of the real outstanding playmaking linebackers in the Mid-Eastern Athletic Conference (MEAC). He can go sideline to sideline in making tackles. There’s not much that gets past him. Leonard has played lights out all season long. He leads the MEAC in total tackles with 79. He also has 46 solo stops. There aren’t many linebackers who play the run better than him. He’s also pretty good against the pass. Leonard has two interceptions this season, returning one of them 64 yards for a touchdown in a win over Howard. In the Bulldogs’ win over the Hornets, Leonard was really special, but he got help from redshirt junior linebacker Dayshawn Taylor. Taylor, a 5-foot-11, 240-pounder, had 10 total and eight solo tackles and 2.5 tackles for a loss. Leonard and Taylor were all over the field. South Carolina State is in the hunt with North Carolina A&T (6-1 overall, 4-0 MEAC) and North Carolina Central (6-2 overall, 5-0 MEAC) for the MEAC championship. The Bulldogs will battle Hampton on the road on Saturday at 1 p.m., and defense could be the key for South Carolina State in this matchup. Morgan State running back Eric Harrell had 21 carries for 121 yards and one touchdown as the Bears dropped a 21-17 decision to North Carolina Central. Grambling State quarterback Devante Kincade had a big day completing 20 of 27 passes for 326 yards with four touchdowns and just one interception in the Tigers’ 59-10 win over Mississippi Valley State. 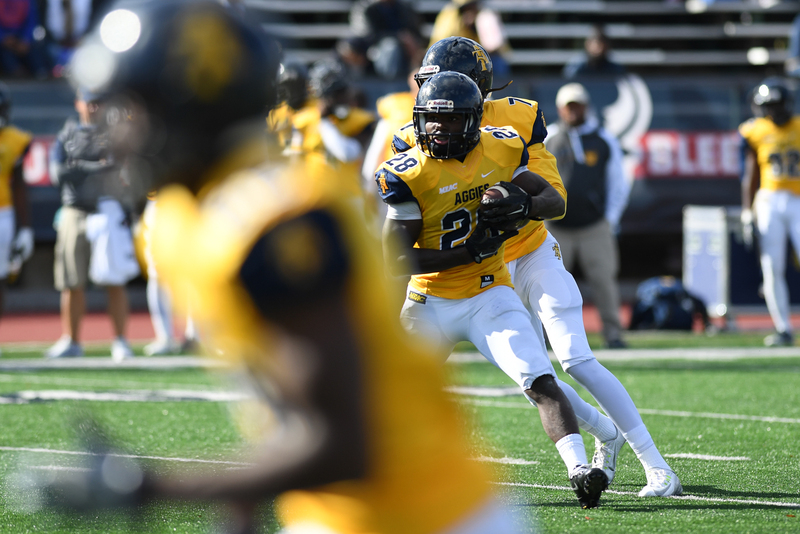 While N.C. A&T running back Tarik Cohen was crossing the 5,000-yard mark in his career, Aggies quarterback Lamar Raynard connected on 13 of 18 passes for 191 yards and three touchdowns in their win at Howard. Jackson State linebacker/defensive end Javancy Jones had eight total tackles, three tackles for a loss and two sacks in the Tigers’ 21-13 victory over Texas Southern. Southern running back Lenard Tillery had 135 yards on 19 carries and two touchdowns in the Jaguars’ 49-17 win over Arkansas-Pine Bluff. Kentucky State linebacker Travon Spencer had 11 total and seven solo tackles in the Thorobreds’ 10-9 upset over No. 5 ranked Tuskegee. Bowie State quarterback Amir Hall was 18 of 29 for 295 yards with three touchdowns and one interception in the 42-35 loss to Virginia Union. Southern wide receiver Willie Quinn had six catches for 92 yards and two touchdowns in the Jaguars’ 49-17 win over Arkansas-Pine Bluff. Donald Hunt contributed to this article.